Ocean Ramsey loves sharks and is doing her part to change the perception of sharks around the world. 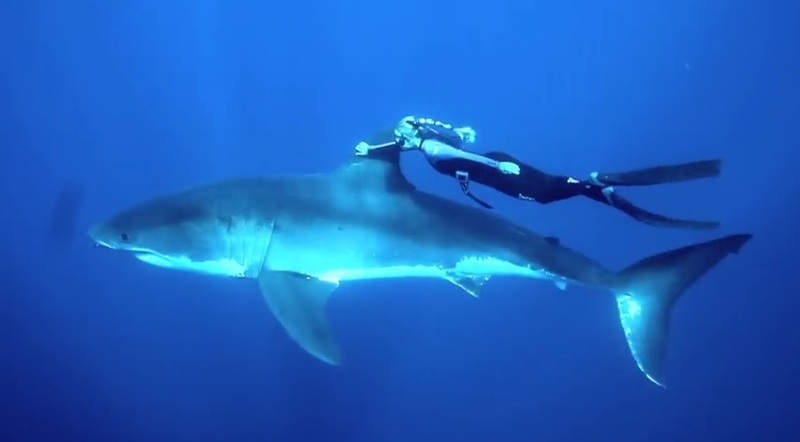 That is right, Ocean Ramsey has been called a shark whisperer. However she is both a model and very capable free diver. In addition, she is a Hawaiian raised scuba instructor. This is the incredible moment a group of divers off Hawaii encountered the biggest great white shark ever recorded. Ocean is dedicated to increase our understanding about sharks. She says sharks are actually shy and afraid of us most of the time. Sharks are being killed because of finning and our insensitivity to the plight of sharks due to movies like Jaws. Watch the following video clip of Ocean Ramsey being interviewed on the Jeff Probst Show. See next page below to see an amazing video of her swimming with sharks.